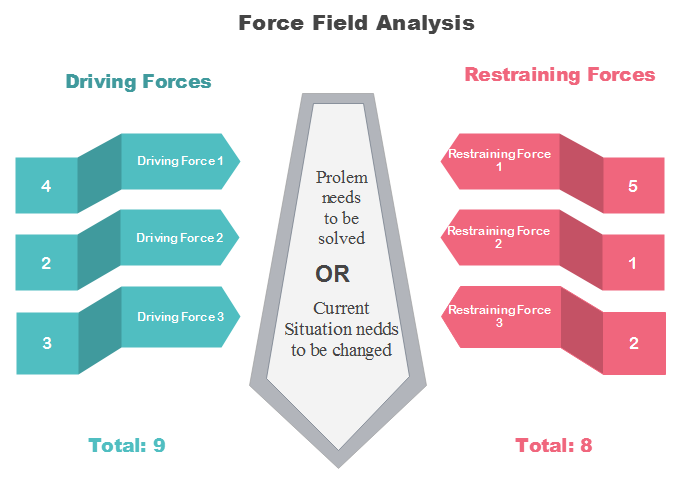 Force Field Analysis Diagram is a simple but powerful tool for listing 2 kinds of forces that will drive and resist a proposed change. The Force Field Analysis diagram is based on the work of social psychologist Kurt Lewin. According to him, human behavior is caused by forces – beliefs, expectations, cultural norms, and the like – within the "life space" of an individual or society. This may sound a little complicated to understand, but once put this theory into diagram, it would be much easier to follow. Here is a Force Field Analysis diagram example for losing weight. Take a close look and we will elaborate on this. As shown in this example, a force field analysis diagram displays the driving forces and restraining forces that affect a question or problem needs to be solved. A force field analysis diagram can be used to compare forces in any situations from different points of view. In this diagram of losing weight, driving forces could be described as the factors that push for change while restraining forces prevent this change. This is the goal of a force field analysis diagram, this diagram is used to analyze these forces to see whether a person should start changing. When the driving forces and restraining forces are equal, or the restraining forces are stronger than the driving forces, there would be no change. The change will only happen when the driving forces overcome the restraining forces.